[Snap] Snap - what speed limited to when over cap? Forums › 2degrees › [Snap] Snap - what speed limited to when over cap? I see Snap limit your speed once you reach your monthly quota, which I've never done before but may do this month. What speed do they limit you to? I endured this for two days once, felt like dial-up or worse, pages timed out, stylesheets took forever, images barely loaded. Yup same here, wen't over my limit about a year ago and my fibre connection was reduced to dial up or worse. I'm on unlimited now so not an issue but at the time I went over I just bought an add on and my connection was back to full speed in half an hour or so. I've gone over before and been limited to 1Mb/s Up/Down. This is on Snap UFB. naggyman: I've gone over before and been limited to 1Mb/s Up/Down. This is on Snap UFB. That would be plenty fast enough for a few days. Maybe I'll go over my cap on purpose just to see what it really does. If it was usable, it'd be ok. But as above I went over once and it felt worse than dialup. Pretty much completely unusable. I went over a few days ago, felt like dial up, so just bought a pack yesterday. I have too long to go in the month to stand that. 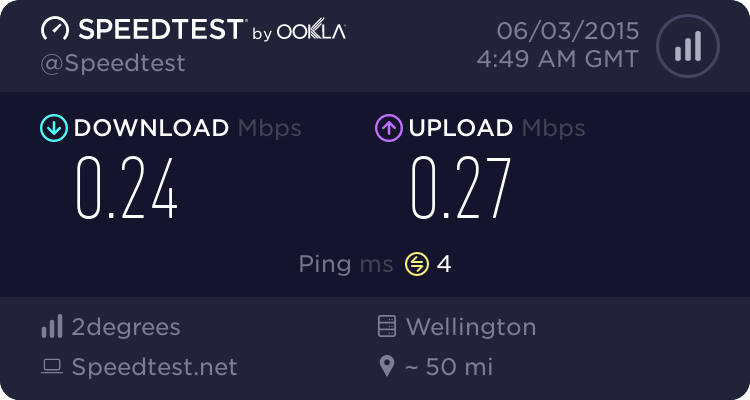 When i last experienced this i wondered what method they were using to rate shape - even when you took every device off the connection and tested with one it was completely unusable with a ton of packet loss. I know websites are more complex these days and loaded with massive JS libraries and media etc, but last time i was capped years ago i don't recall it being this bad, just really really slow. It seems to be around 256kbps (0.25Mbps) once you hit your limit. The web is usable, but graphic heavy sites are slow. Multiple tabs of stuff load very, very slowly. I added a data pack. It was applied instantly.